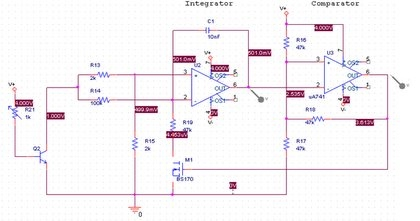 This circuit demonstrates two applications for light measurement. The idea for this circuit is based off the musical Theremin which uses changes in capacitance to alter the volume and pitch of the output sound. This circuit has two features (producing an output signal as a square wave and as a triangle wave). The circuit takes in light through a phototransistor and uses an op-amp circuit to vary the frequency of the output signal based on the amount of light.